Whether on four wheels, two wheels or two feet, you can explore a beautiful, forested Neris river valley on this 25 km long tourist route. It curves along the greatest (mushroom-shaped!) turn of the Neris, approaching the river and again turning to the dense forest. This circular tourist route is a sandy forest road that meanders through a variety of scenic woodland environments, with stops at most interesting natural and cultural heritage objects. 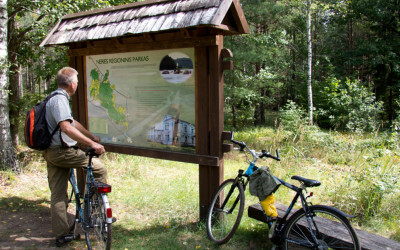 On this 25 km long journey, you will see the scenic Neris river, the picturesque hills and pine forests, the old Paneriai manor house, mythological stones and springs, mysterious “Circle of Witches”, two observation sites with magnificent river valley panoramas, ancient Padūkštai burial mounds and much more. Travel bravely – along the entire route, you will be guided by wooden direction indicators. Forest road. While traveling along this route, you‘ll stay in a forest almost all the time. This route will take you to a fine Paneriai pinewood, where pine trees over 130-year-old and an undergrowth of oaks are greening together. 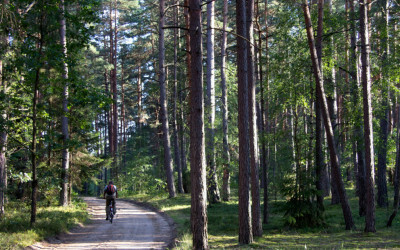 Further down the road the forest is changing – pine trees are followed by spruces, and the wood turns mysterious… This route also winds through dark and gloomy lindenwoods, and sunny pinewoods that are full of blueberries in the summer and mushrooms – in the autumn. 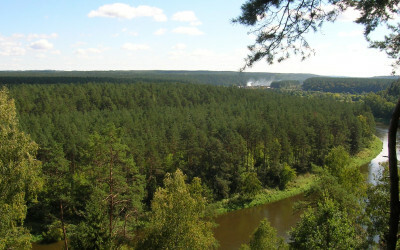 The observation towers of Ausiutiškės and Paneriai Wood. Nature has been generous to our park, and its beauty lies in the landscape’s diversity. 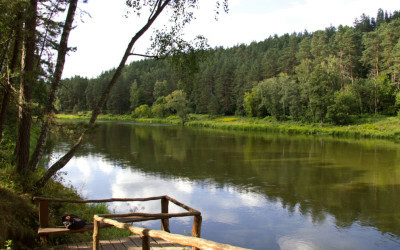 While enjoying it, you will be gazing in different directions – down to the Neris river or fragrant forest floor, up to the blue skies or vibrant green pine tree crowns, and down from above – to endless surrounding woods. In this tourist route you will find two observation towers which reveal such views. And there is nothing more to tell you – you‘ll see it all with your own eyes. „Cursed wedding“ stones. 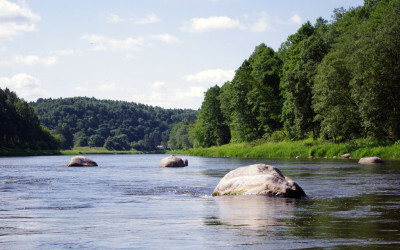 Many of the stones resting in the Neris‘s waters are not ordinary, but have names and are connected with ancient Lithuanian beliefs, cults and culture; therefore they are called mythological stones. 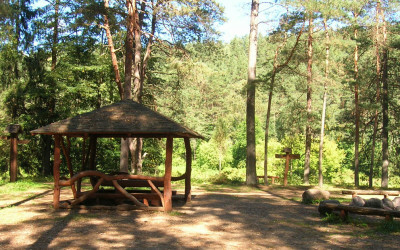 One of the most interesting legends are told about a cluster of stones near Verkšionys village. Local people say that a bride’s mother, in dislike of her future son-in-law, cursed the newlyweds and their guests saying: „Turn into stones!”. When their carriage was crossing the river, it turned over and the entire group turned into grey boulders. Conglomerate. This stone-like, but very brittle natural sculpture lies on the left bank of the Neris, by the riverbed. It has been here for tens of thousands of years. Nature created it much like a contemporary homebuilder, who is laying foundation for a house – sand, gravel and pebbles were cemented together. Such conglomerate rocks are rare in Lithuania, therefore this one is a state protected natural heritage object. Demarcation line. For our ancestors, the Neris river was a boundary separating the worlds of the dead and the living. From 1919 to 1939 it was also functioning as a demarcation line between Lithuania and Poland. 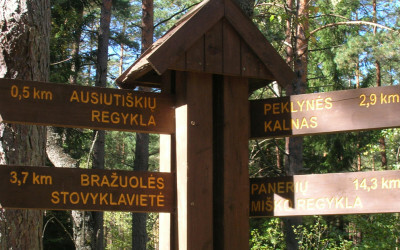 Since Lithuania did not officially acknowledge this border, the international regulations of delimitation were ignored. The marking of the boundary differed from one region to another: it could be a furrow, a line of straws or, as in here (Vievis district), a simple wooden broom stuck in the ground.